The photographic honour roll commemorates those from Mead and District who served in World War One. 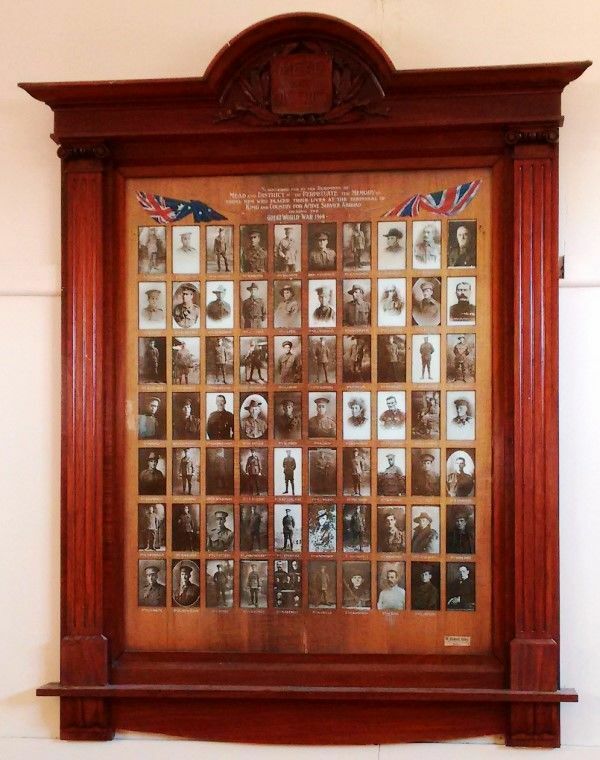 On Wednesday, the 17th inst., about 300 people assembled at the Mead Mechanics' Institute to witness the unveiling of the District Honor Roll and to honor the men whose names and photographs have thus been preserved for an example for future generations. The stage was appropriately decorated with flags and suitable emblems, and presented a tasteful effect. The Chairman of the Mechanics' Committee, Mr T. H. Pettigrove, presided over the gathering, and, after a few appropriate remarks, called on the secretary to read a short statement about the preparation and cost of the frame. Mr H. Angus, M.L.A. then addressed the gathering, speaking forcibly and with much feeling. He reminded his audience of the deep debt they owed those who had given their all for King and Country. He emphasised the need for unity at this critical period and strongly deprecated the action of persons who were by word and deed attempting to divert the minds of their fellow citizens from the earnest prosecution of the war. He exhorted all present to exert every effort to obtain victory and thus prove worthy of those whom they had met to honor. 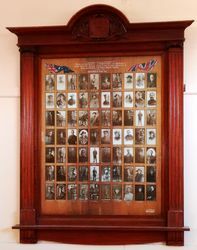 Mr Angus then unveiled the Honor Roll, revealing the names and photographs of 67 soldiers, Mr Angus observing that it was the first roll in this electorate in which the names and portraits were happily associated. The Rev. E. Griffiths, Cr Randall, and Mr John M'Donald also addressed the assemblage, and Cr Randall, on behalf of the Kerang Shire, presented Mr A. Strachan and Mr R. J. M'Donald with war certificates. A vote of thanks to the speakers was proposed by Mr C. L. King, seconded by Mr T. A Howieson, and the singing of the National Anthem concluded the ceremony. The Honor Roll, which was the subject of general admiration, is in a massive blackwood frame of Grecian design. The inscription on the top of the mount reads—"Subscribed for by the residents of Mead and district to perpetuate the memory of those men who placed their lives at the disposal of King and Empire during the great war, 1914. — " The mountings are of fiddlebaok blackwood, and the names stand out plainly under the photographs. The frame was designed and executed by Mr Vincent Kelly, of Bendigo, and reflects much credit on his artistic ability. Afternoon tea was thoughtfully provided by the ladies, and thus ended an interesting and memorable day. Kerang Observer, 24 April 1918.